Laser Therapy delivers a soothing, deep penetrating photonic energy, which brings about physiological changes. The inflammation and pain is reduced, creating increased circulation at the site of the injury. The damaged tissues are able to begin the natural process of repair. Laser technology is an innovative, scientifically-based therapeutic modality. This technology offers the best in pain relief and expedited healing times. The best part about this treatment is that is does not require the use of drugs or surgery, and there are no known risks or side effects + a 90% Satisfaction rate after just 1 treatment! The Laser uses infrared light to interact with tissues at the cellular level. Higher levels of ATP are produced which then increases the metabolic activity within the cell, improves the transport of nutrients across the cell membrane and initiates the release of nitric oxide. These events lead to a cascade of beneficial effects increasing cellular function and health. With each painless treatment, laser energy increases circulation drawing water, oxygen and nutrients to the damaged area. This creates an optimal healing environment that reduces inflammation, swelling, muscles spasm, stiffness and pain. As the injured area returns to normal, function is restored and pain is relieved. Deep Tissue Laser Treatment is an innovative, scientifically-based therapeutic modality. This new technology offers advanced pain relief and expedited healing times through a process known as photobiostimulation. Deep Tissue Laser Treatment delivers deep, penetrating photonic (light) energy to bring about profound physiological changes. ATP (Adenosinetriphosphate) production is increased, inflammation and pain reduced, and circulation increased at the site of pain. These changes in cellular chemistry are triggered by the deep tissue laser making it a true healing modality. Deep Tissue Laser Therapy does not require the use of drugs or surgery and therefore no known side effects or risks that may occur with other forms of treatment. In addition, it can often achieve results faster than other treatment modalities. During the treatment the patient will feel deep soothing warmth. This pleasant sensation reassures the patient that the laser is stimulating cellular activity. Low Level Laser enhances metabolic activity at the cellular level, without generating tissue-damaging heat. The Super Pulsed Laser, approved by the FDA in 2006, packs a punch while remaining non-invasive. The Super Pulsed Laser is capable of reaching depths of 6 to 9 inches, with a treatment beam of up to 3 inches. 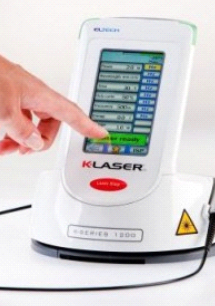 Because the Super Pulsed Laser reaches deep into the tissues, it is ideal for treating sprains and strains, arthritis, calcified muscles and fibrotic adhesions, as well as intra-articular tissues inside of the joints. Its far-reaching capabilities also allow the Super Pulsed Laser to achieve results in less time than most cold lasers currently used today. With treatment times of as little as 5 to 15 minutes, the Super Pulsed Laser allows many conditions to vastly improve within a few visits. ©2018 Bellevue Pain Institute. Do not copy. All rights reserved.